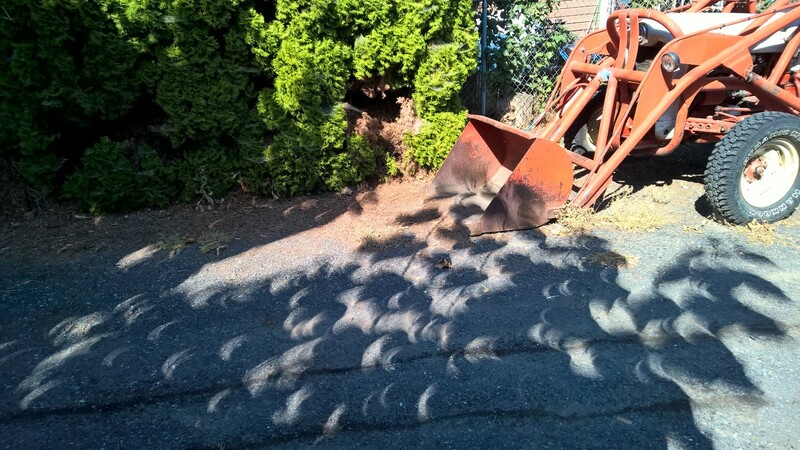 The eclipse in leaf shadows from the princess tree. We were at 95% totality here, which was pretty cool. Literally, even. The temperature dropped considerably for the ten or so minutes surrounding the peak, and I felt like putting on a sweater (although I didn’t because it just felt wrong knowing we’d be back up in the 90s in minutes). I was neck deep in prepping plums that day, so I watched from the deck while I cut out pits and ran the food strainer. The eclipse kept me company, shining through the leaves in the maple and scattering images across the table and everything I had on it. The Squeaky Minion observing the eclipse. Periodically I ambled down the steps to the driveway, where the kids took turns viewing with the box we made and the Minion welding helmet. All in a all, a fun couple of hours! One of the restaurants I miss is Olive Garden. I learned long ago that some things are worth the time and effort to recreate, like their signature soup. I don’t remember where I originally found this recipe, but it has been in my little wooden recipe box for years. 1) In a large pot, melt the butter and saute onions and garlic. 2) Add chicken broth, water, and potatoes. Bring to a simmer and cook until potatoes are tender, about 15 minutes. 3) Add remaining ingredients and simmer until heated through and kale is completely wilted and darker green, between 5-10 minutes. Serve with your favorite bread product! Traditionally I think the soup uses a pork sausage, but I use turkey or chicken. Reduce cooking time even more by pre-cooking the potatoes in the microwave or using leftover baked potatoes. For times when I didn’t have sausage, I have cooked up to 1 pound of ground turkey instead with fine results. If you like thicker soups, reduce the water by 1-2 cups. Perhaps this is another “doesn’t everyone know how to make this?” post, but up until a couple years ago, I actually didn’t know how to make this. The recipe below is adapted from my The Joy of Cooking cookbook and is my personal favorite. The majority of the kids like it too, so that’s a bonus. 1) Heat oil in a large skillet over medium heat. Saute onion until translucent, then add garlic and stir for another minute or so. Transfer to a bowl or plate and set aside. 2) Add beef to the skillet and break it up, cooking until it’s just browned. Return the onion mixture to the pan and add the ketchup, water, worcestershire sauce, hot sauce, salt, and pepper. 3) Partially cover, reduce heat to simmer, and cook about 15 minutes, stirring occasionally until sauce thickens. Serve over your toasted bread of choice. My couch/ rocker chair after an hour and a half of folding laundry. It almost never looks like this, hence a picture. The formerly clean and clear deck after two minutes of kid play. It almost always looks like this, but it still amazes me how much kids can accomplish in mere seconds. One of the Dearliest’s favorites. 1) Pre-heat oven to 325 degrees F.
2) In a large bowl cream together butter and sugars. 2) Beat in eggs one at a time. 3) In a separate bowl sift together flour, baking powder, and salt. 4) Gradually mix dry mixture into wet. 5) Stir in nuts/ raisins/ oats. 6) Drop large spoonfuls of dough onto cookie sheet, then bake 12-15 minutes or until edges are golden. 7) Remove to cooling rack. For times when I want a slightly healthier cookie (for me, this means no refined sugar), I have successfully adapted this recipe to honey. The texture is not quite the same, but it’s still a nice, chewy oatmeal cookie. To compensate for the extra moisture, add 1/4 cup to the flour (making 2 cups total). Sometimes I use half wheat flour, as it adds a little nutty flavor. Yes, this is a paper plate. I make no apologies for it. I went off this recipe only I didn’t really measure, did everything to personal taste, and cooked way more than 6 eggs (not pictured). 1) Boil some eggs. I like the Alton Brown method of: submerge eggs in cold water, bring to rolling boil, then remove from heat, cover, and let sit for 15 minutes. Then plunge into ice bath, or run through cold water, or whatever your preference is for stopping the cooking process. I never end up with green edges on the yolk with this method. 3) Fill your eggs. Piping is great for a neat, uniform presentation, but I was hungry. Spoon plopping works just as well. 4) Dust with paprika. Or cayenne for more kick! If you follow my Instagram (which I have dubbed “Food, Flowers, and Song”), some of these will be familiar. The kids are up to their usual shenanigans, including costume parties, hacking Mama’s tablet, and stuff. Nothing says “summer” like your sister’s hat! The most recent bouquet arrangement from Pokado. She’s a natural. The weather is hot hot hot (100+ F for the next ten days, yuck), but even still it occasionally produces something worth going outside to see, like the biggest dust devil I’ve ever seen. You see that brown field waaaay off to the left? That’s where it was. It’s not so clear here, but it goes all the way to the top of the photo. If I’d taken it just 3 seconds earlier, it would’ve been a lot fuller looking. Crepes with cream cheese filling + nectarines. Masoor Dal and Baked Naan. Won’t bake naan again. It’s just not the same! Okay, I didn’t bake this, but I was about to since it looked like the Dearliest couldn’t find any around town. Last night’s dinner: I grilled for the first time in 7 years! There were no leftovers.